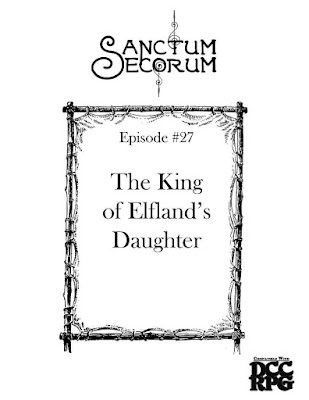 The Sanctum Secorum Episode #27 Companion: The King of Elfland's Daughter was written by Bob Brinkman, Jen Brinkman, and Clifford Morton. Art is by Blacknemera, James Zapata, Joana Rita Gomes, Jonathan R. Neill, Kenneth Sofia, Miroslav Petrov, Nicolas Raymond, and Thibault Girard. The publisher is Sanctum Media. This product is produced in association with the Sanctum Secorum podcast. This Episode Companion is based on Sanctum Secorum Episode 27: The King of Elfland's Daughter, which discussed the novel by Lord Dunsany. The featured adventure was Through the Dragonwall by Daniel J. Bishop. The King of Elfland's Daughter was also discussed on the Appendix N Bookclub podcast here. Appendix C in the core rulebook deals with curses in-game, as they appear in Appendix N fiction. There are some excellent uses of curses in Dungeon Crawl Classics adventures - The Sea Queen Escapes and The One Who Watches From Below spring immediately to mind - but you can never have too many examples to draw from. Curse of Impotent Fuel: Supplied by Jen Brinkman, this curse keeps the home fires from burning. Or the travel fires, for that matter. While this might seem minor, when you consider how much we humans rely upon fire - and not only for warmth and light - you might treat this one with a bit more respect. Curse of the Mislaid Broom: Witches use brooms to get around, and this minor curse by Jen Brinkman makes a witch's broom much harder to find. Curse of the Faerie Ring: This major curse, by Bob Brinkman, traps its victim in Elfland. The Blood-Drinking Box, Part 2: Clifford Morton continues the tale started in Sanctum Secorum Episode #25 Companion: The Fallible Fiend. This is based of off Terry Olson's Elzemon and the Blood Drinking Box. Black Stick of Ziroonderel: This black stick, owned by the witch Ziroonderel, has a number of powers which are more useful around the house than in an adventure. Nonetheless, items like this are great for giving a campaign milieu verisimilitude, and these minor powers can also be used to impress PCs. Write-up by Bob Brinkman. Broom of Flight: Next to her familiar, this is a witch's best friend. Write-up by Jen Brinkman. Sword of Alveric: "Using runes forged of fallen thunderbolts, the witch Ziroonderel crafted this magical blade, capable of standing against all but the mightiest runic magics of Elfland." Seriously, Lord Dunsany is worth reading for his creation and use of magic items alone. For another example of the creation of a magic sword which would be cool to emulate in a Dungeon Crawl Classics adventure, see The Fortress Unvanquishable, Save for Sacnoth. Write-up by Bob Brinkman. Hounds of Erl: Elf-hounds bred to hunt unicorns. Knight of Elfland: The hollow knights of Elfland. For similar creatures see the Sanctum Secorum Episode #24 Companion: Three Hearts and Three Lions and The Revelation of Mulmo. Troll, Dunsanian: These are nothing like the classic Dungeons & Dragons troll, which is modeled off the work of Poul Anderson and the Harold Shea stories of by L. Sprague de Camp and Fletcher Pratt. Instead, these are fun-loving creatures which serve the King of Elfland. Unicorn: Exactly what it sounds like. Will-o’-the-Wisp: Not the Dungeons & Dragons creature of the same name, but diminutive beings of Elfland. As with previous Companions, this volume can help the discerning Dungeon Crawl Classics judge determine how to stat up creatures from whatever movie or literature she likes.